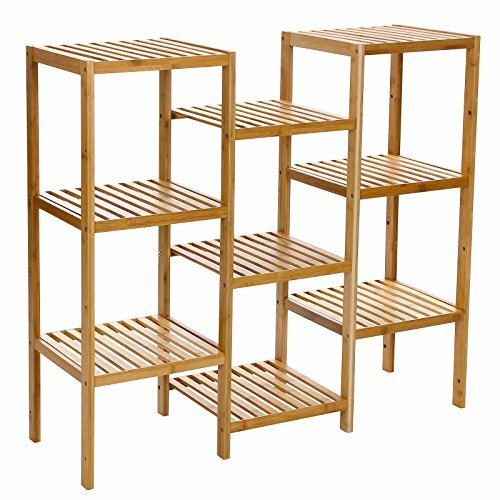 The SONGMICS 9-tier bamboo rack features sturdy bamboo and refined craft, creating additional space to your home. Considerable design makes it a better choice to your bathroom, living room, kitchen, balcony or any other space to display and store items in style. It can be used as a storage rack for toiletries, towels, sundries, decorative things, knick knacks, shoes, books, plants, spice and small appliances. This is a customizable shoe rack, which means you can assemble it into different style of storage racks. You can also remove a layer to meet your special storage need. Easy to care and clean. The nice bamboo will well match with your furniture in your home. PRODUCT DIMENSION: Overall product dimension:37.8""L x 35.4""H x 13""W. Match well with your furniture and add a special condition to your bathroom, living room, balcony, kitchen, etc.